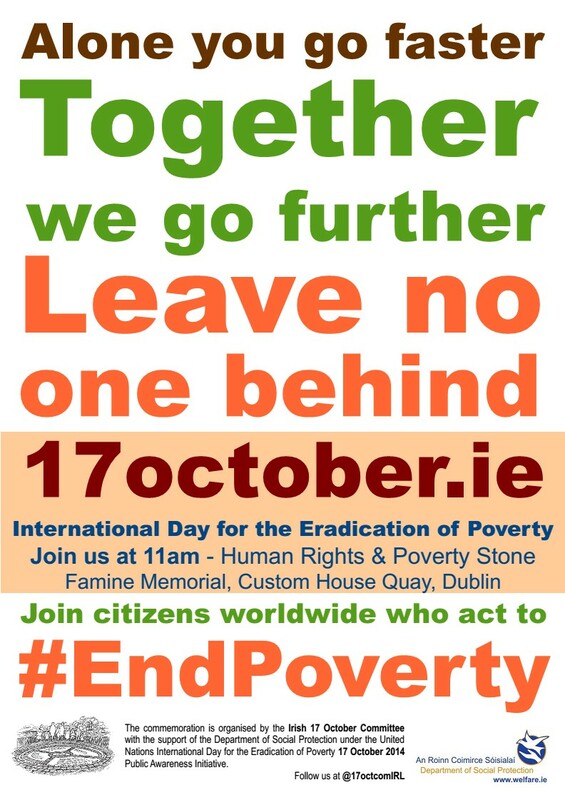 The Irish 17 October Committee (www.17october.ie) invites you to join people from all walks of life and from every sector of society who will come together to express solidarity with people experiencing poverty and social exclusion. 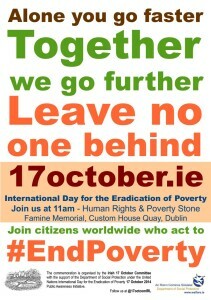 The UN Day for the Eradication of Poverty Commemoration – beginning on Friday 17 October at 11am close to the Famine Memorial on Custom House Quay, Dublin – is an opportunity for people and communities to have their voices heard through personal testimonies from people who experience poverty, as well as through music, stories, and presentations from school children. Different people will share their experiences and hopes. The 2014 UN theme of the Day is :“Leave No One Behind: Think, Decide and Act Together Against Extreme Poverty”. “Leave No One Behind”- means putting an end to discrimination based on social disadvantage, and ensuring that no one is forgotten in our efforts to build a more equitable world. “Think, Decide and Act Together Against Extreme Poverty”- means deciding to do what it takes to ensure that people living in extreme poverty become the primary partners in programmes to overcome poverty and promote development. Only by working together with them will we be able to ensure that no one is left out. Exhibition of art work created by different Irish projects to mark the UN Day. Wresinski’s address from 17 October 1987 by – Young people from the North Wall Community Training Centre. 12.20 pm approxiamately. Closing address by the M.C.